This post continues with differences between sysudoku advanced solving and the Paul Stephens “extreme” order of battle. In particular, the power of full Medusa coloring compared to Stephens’ limited multi-colouring. Let’s begin with a checkpoint for solve-along sysudokie readers. 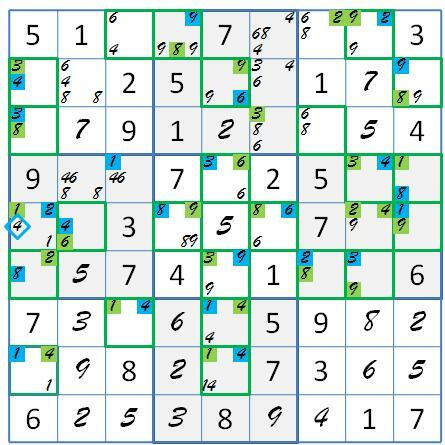 In Mastering Sudoku Week by Week, Paul Stevens describes the solving techniques he expects his readers to find in the Week 48 puzzle. In my previous post, examples from Weeks and The Sudoku Addicts Workbook showed us what Paul means by this description. After sysudoku basic solving, Week 48 collapsed in the bv scan, before encountering Stephens’ knockout punches. I suggested that you restart the puzzle after the two UR eliminations, and attempt to reconstruct Stephens’ results. Here is my checkpoint report on that. To bypass the collapse in the bv scan stage, we restart after the two NUR eliminations and resulting 8-wing. The X-panel at that point is revealing. I’ve introduced simple coloring to show the connections between methods. There were no candidates left for the 5- and 7-panels. We do have a swordfish in the 2-panel, but it’s a dead one, i.e. no victims. The 3-panel has two disconnected and dead 3-wings. Dead jellyfish inhabit the 1- and 9-panels. In the 8-panel the blue/green cluster spreads across a dead jellyfish and a dead 8-wing. It was not a good day for fishing. Too windy? 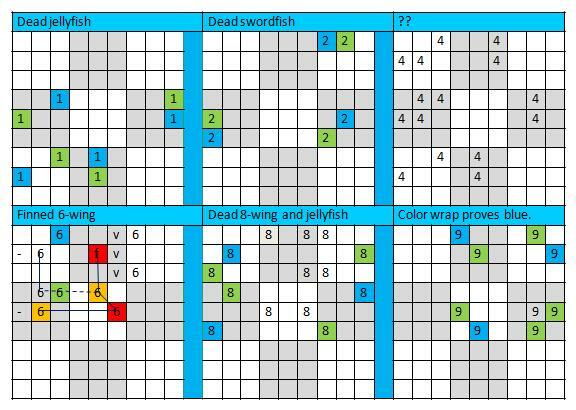 No, live fish are somewhat fished out by effective sysudoku basic solving that has already removed many victims. But the 6-panel and the 9-panel have more to tell us. Let’s look at the 6-panel first. There are two “conjugate pair chains”, i.e. coloring clusters. One color traps 6 in r2c2. This in itself proves blue, then red. Alternatively, you can use a bridging wink, with green seeing orange, and thereby proving blue or red. The r2c2 candidate sees both colors. Alternatively, there is a skyscraper to do the same elimination. Another 6-chain removes 6 in r2c6, proving red, then blue. Simple coloring often duplicates the X-panel analysis of X-chains. Going beyond Stephens, my readers see something else in the 6-panel, a finned 6-wing on rows 2 and 5, with r2c5 as the fin, marked ‘f’. The three victims are in the box with the fin. A finned fish is handicapped, but any would-be victim that sees (is related to) the fin is indeed a victim. But there is more. The candidate in r6c2 is a would-be victim that escapes, because it does not see the fin. Instead, if it is true, so is the fin. This is kraken analysis, another productive solving technique that Stephens never mentions, that sysudokies routinely find with finned fish. The 9-panel above is probably home to the 6-square conjugate pair chain that Paul was hinting at. But in this grid, Week 48 demonstrates that Stephens’ multi-colouring enlists only a small fraction of the power of Medusa coloring. The grid shows where the blue/green cluster of the 9-panel goes when coloring includes the slinks in the bv cells, and skips to 1, 2, 3, and 8-candidates. Note how many more squares are immediately solved when blue is proved true! Bottom line, these review posts have called attention to many gaps and limits in the Stephens solving repertoire. In view of these, is “Mastering” the right title word? We might also wonder what kind of “Addicts” Paul has in mind. Sysudokies are a type of Sudoku addict, but the reviewed Stephens’ books are not much more than puzzle books for them. Certainly not reliable instruction books on solving. Next time, I’ll be analyzing a positive contribution to sysudoku from Stephens’ books. Strangely enough, it’s his procedure for Nishio. This entry was posted in Advanced Solving, Expert Reviews, Puzzle Reviews, Stephens and tagged finned fish, kraken analysis, Medusa coloring, multi-colouring, Paul Stephens, X-panel. Bookmark the permalink.